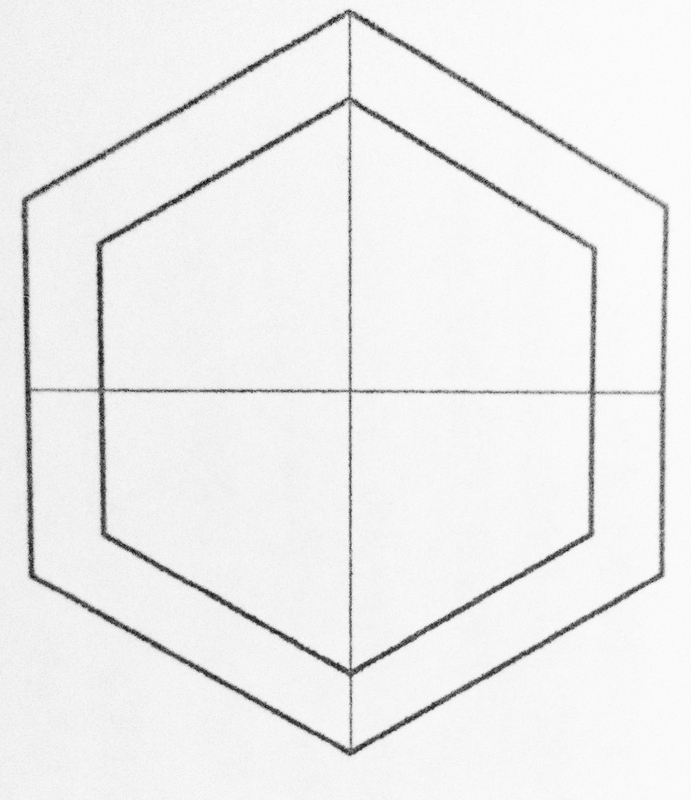 A hexagon is measured along its side, which is equal to the radius. 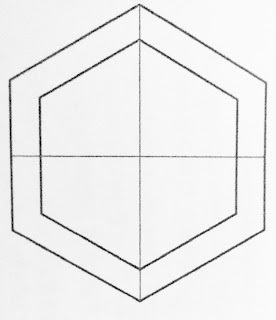 * for a 1/2" hexagon - allow 1/4"
* for a 3/4" hexagon - allow a scant 3/8th"
* for a 1" hexagon - allow 3/8th"
* for a 1 1/2" and over - allow 1/2"
Hold your plastic template over the fabric and cut around the shape. It isn't necessary to draw a line first. Remember the papers will be accurate, the fabric is approximately accurate. If you are fussy-cutting a motif, the lines will help align the same centre point and direction of your motif. If you are not fussy-cutting, fabric can be folded to cut as many thicknesses as your scissors will allow - I cut up to 6 thicknesses. Baste the fabric over the papers without stitching through the paper - see English Paper Piecing - 2. This way the papers can be removed without removing the basting. The basting secures the folded edges and prevents them bunching when the work is washed. Traditionally, English Paper Pieced work was not quilted. They were used as decorative coverlets on beds or furniture or as bed and curtain hangings. Papers were sometimes left inside quilts made for charity - this added an extra layer of warmth - there is a reference to the "rustling of the quilt" in Oliver Twist.